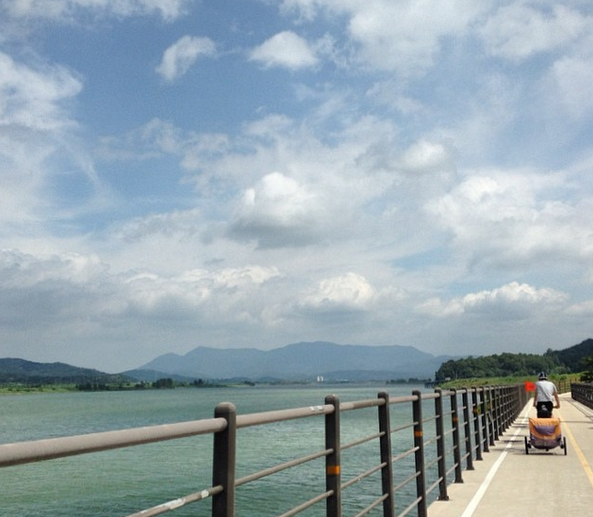 The roughly 90-mile stretch from Gumi to Andong is an excellent leg of Korea’s bike paths. It’s beautiful, hilly and offers plenty of options for food, drink and shelter. This past weekend my friend and I did it over 3 days with two 3-year olds in bike trailers while taking our sweet time. Here is a brief log of our trip and what to expect along the way. We drove to Gumi and parked under the South-Gumi Bridge (남구미대교). You can find plenty of parking here and it is right off of the Nakdong River Bike Path on the west side of the bridge. We cycled along the Nakdong River through Gumi along mostly flat paths all the way to Gumi Dam(12 miles/21km) for lunch. There you will find a certification center and on the other side of the river a small mart where you can buy drinks and food. Once you get north of Gumi there are some beautiful stretches of path. That afternoon we went from Gumi Dam(구미보) to the outskirts of Sangju(상주) (21 miles/37km) The afternoon ride was a little more challenging with a couple of climbs, but nothing too strenuous. You might have to push your bike up these steep hills, but without two kids and a heavy trailers they’d be mostly forgettable. You’ll find these hills the closer you get to Sangju, but will be rewarded by beautiful farmland, small villages and quiet trails. 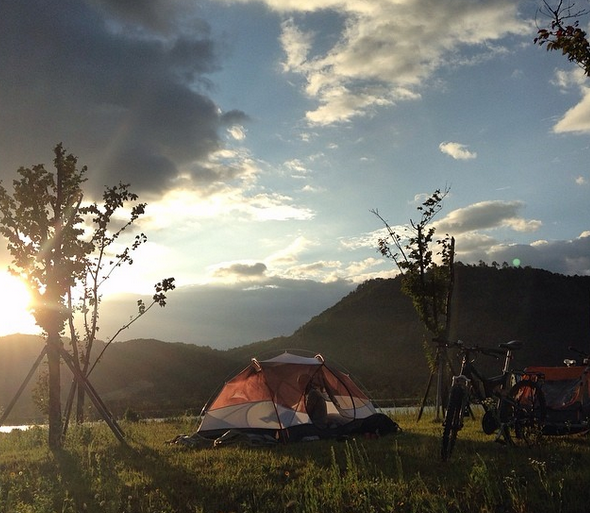 Then you’ll come back to the river and cycle by giant parks on the river that would be ideal for camping. They were preparing for a festival this weekend and we were looking to camp closer to Dowon Restaurant (도원식당) where we planned to eat. We camped in between Sangju Dam (there is a certification center here) and the nearby Sangju Bike Museum (상주 자전거박물관) within sight of Donam Seowon(a Confucian Academy) (도남서원). The duck soup at the Dowon Restaurant wasn’t worth the money (40,000 won), but the side dishes were great. Also, there isn’t really any other restaurant options nearby that I could find on Naver Maps. However, they did have a big menu so you have plenty of other options. Camping outside of campgrounds isn’t a common practice in Korea, but not really policed. Make sure you leave the area looking better than you found it. Good parking, easy cycling, plenty of places to stop. The scenery was a plus and the area around the bike museum offers plenty of activities(hiking, canoeing, museums, eating, amusement park, sculpture garden, karaoke!) if you aren’t in a rush. The museum can be fun too. It isn’t something you must stop at, but it’s a great spot for cooling off and geeking-out over unique bikes. Areas around the dams usually have marts for food, water and drinks. 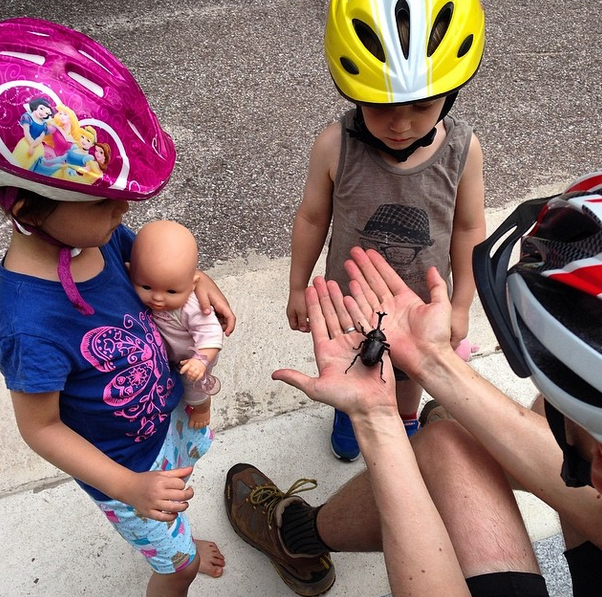 We started our second day around Donam Seowon and cycled to the sculpture garden just past the bike museum (1.75 miles/2.8km) for a long break so the kids could play with a Japanese Rhinoceros beetle. Also we had to push up a relatively steep hill just before the garden so this gave us a nice break for play and coffee. Around the sculpture garden there are plenty of restaurants (on a trip last year I had a great bibimbap at one of them) and even an amusement park. We were up so early that everything was closed. 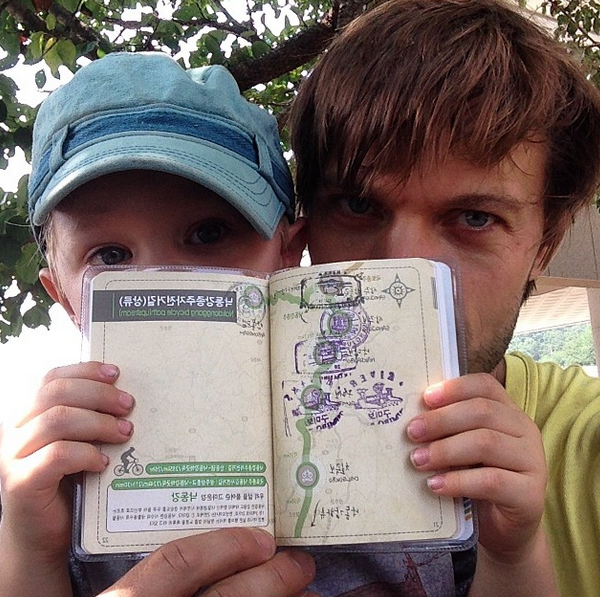 Surprisingly, biking Korea’s bike paths is perfect with kids. It’s relatively safe, there are lots of places to play and there is plenty to look at. The route from Sangju to Gudam (구담) (22 miles/35km) is a lonely, hot and beautiful route. Last summer, my friends and I ran out of water and we found it difficult to find places to replenish. This time we had enough water, but got hot and hungry and had to stop by the side of the trail. Usually you can stop at a shelter somewhere along the way, but there wasn’t one nearby so we sat by the trail. Gudam, however, is a nice reward for your labor. The trail goes through this small town where you have lots of choices of places to eat or marts to pop in for a cold drink or ice cream. If you time it right you can see an old traditional market there. People here still kind of marvel at foreigners. I really love stopping here. See my post from a moment I had there last summer. From Gudam you go a few more miles on trail, but then have a long stretch of road. It is a quiet road that leads you close to the entrance of Hanhoe Folk Village (6 miles/10km from Gudam). If we had planned it better we would have stayed here Saturday night, but our schedule didn’t allow it. It’s a great little walled village with nice guesthouses and restaurants around to give you a true traditional Korean experience. We cycled on to Andong (21 miles/34 km from Gudam). This stretch boasts two big climbs and two big descents. The second hill takes you down to the Nakdong River into Andong, a welcomed sight. We played along the river at a park with a pool and stayed in downtown near the Home Plus in the Mong (몽) Motel for 40,000KRW. They let us put our bikes and trailers inside in a hallway and gave us water and juice when we left the next day. They were lovely proprietors of a shady motel. I’d stay there again. 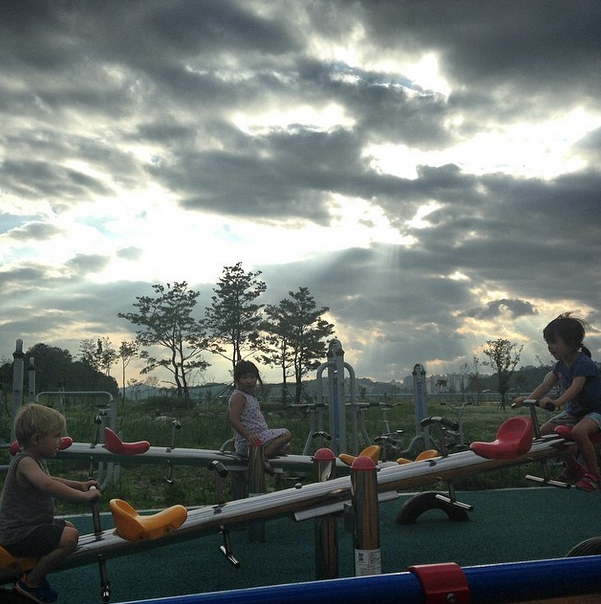 Andong has plenty of restaurants and lots of green space on the river for the kids. I only wish we had arrived earlier in the day. The paths often take you past parks and swim areas in bigger cities. In Andong, the river is a great place to hang out for adults and kids. Highlights: Gudam, beautiful stretches of path, great descents, Hanhoe Folk Village and Andong. A formality for those looking to get their passport stamped. This was something that could easily be done on day 2, but we had tired kids and we were all hungry. It took us all of 15 minutes to get there from downtown Andong. There is a traditional village and other sights here, but we were hot and tired and ready to head home. We loved stamping our passport and our hands. To get back to our car in Gumi we decided to take the bus as it was the most direct option. The Andong Bus terminal is as on the other side of Andong as you can get from the dam. We followed the river until the river path ran out and then hopped on the road for the rest. The road was narrow and a long climb to the top of a hill before it descends down to the bus terminal. Having a kid in a trailer is not recommended. Cars respected us with space, but I was not comfortable with the situation. Unfortunately it was that way or through the city. I think next time I’d slowly snake through the city. Alone, I’d go the way we went. The bus just had enough space for 2 bikes and 2 trailers. It would have been difficult if people had lots of luggage. We probably would have had to take two different buses. The bus drivers were cool, no shaking heads or sucking air through their teeth in disbelief of what we were loading onto their bus. Just smiles and curiosity. Highlights: Breakfast in downtown Andong. Lunch places out by the dam. Andong. For maps see KTO’s e-books or if you read Korean Naver Maps can be quite helpful. You can pack a tent and cooking equipment, but there is plenty of food and shelter along the way. We only used these things on the first night. I’m not sure I’d take them again for weight and simplicity sake. If you do camp there are plenty of green spaces along the river. Just be smart where you pitch your tent and be respectful of the land. If you are traveling with kids bring toys and books and stop often. See a cool bug? Stop. See a playground? Stop. See a place to swim? Stop. It will keep you and your kid sane. For emergencies carry a lollipop. Immediate gratification and at least 20 minutes of entertainment.